“When we step out onto the football pitch together, we forget about everything. We forget about our poverty, our old age, our challenges,” says Beka Ntsanwisi, a 59-year-old radio DJ in Limpopo, South Africa. She’s referring to her friends and fellow players for Vekhegula Vekhegula, a football league she founded a few years ago to shift the stereotype of what means to be a “Gogo” (a grandmother). Beka recruited like-minded “Gogos” who shared her zest for life. The youngest is 50 and the oldest is 84, but they’re not letting their age slow them down. During those first few practices, some of the ladies could barely walk, let alone play. But Vekhegula Vekhegula, which translates in the native dialect of Tsonga as “Granny’s Grannies,” quickly got the hang of their newfound passion. Their love for each other, and the game, is helping them live happier, healthier and more fulfilling lives. Some of the grannies even adopted nicknames of international footballers. “They call me Maradona, because of my skills,” says Christian, 57. Their story inspired Coca-Cola, who surprised the team in November 2013 by bringing the actual FIFA World Cup trophy to their training center. The entire team was overcome with emotion. When the Gogos saw the trophy, they spontaneously broke out into a celebratory song and dance. And the fun didn’t end there. Several weeks later, Coke returned to the Gogos’ training center with an even bigger surprise. The will depart on June 14 to watch two FIFA World Cup group matches at Maracana Stadium in Rio de Janeiro and more. Their trip will be documented and shared online. 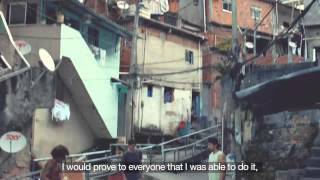 The Gogos’ story is one of a handful of short films Coke produced as part of “The World’s Cup” campaign for the 2014 FIFA World Cup, which kicks off next week. The films, which put a unique spin on Coke’s popular “Where Will Happiness Strike Next?” platform, were shot during the 90-country, 92,000-mile FIFA World Cup Trophy Tour. Each shares the story of fans who use the game to triumph over adversity and inspire others to do the same -- from a blind football team in Brazil, to the subjects of an iconic photo from 1978. At each film’s climax, Coke surprises the protagonists with a special viewing of the FIFA World Cup Trophy.